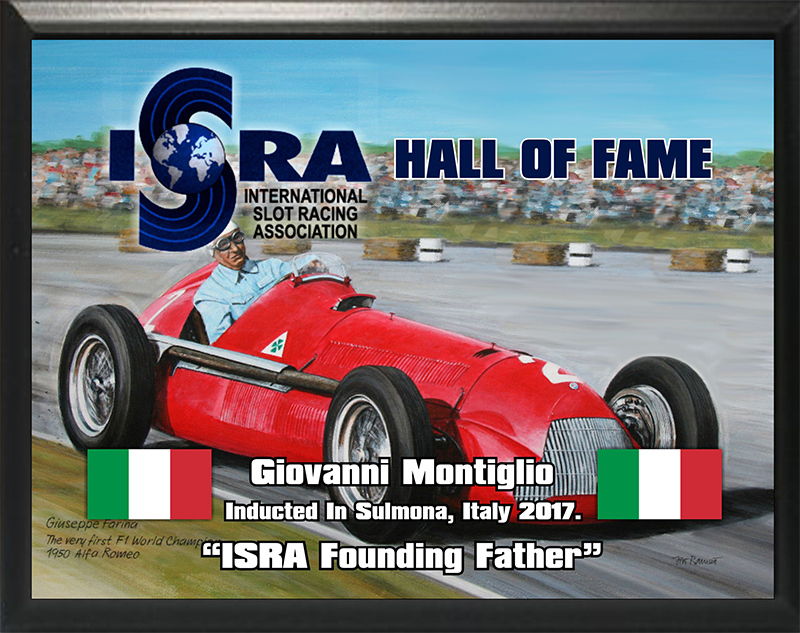 Giovanni Montiglio from Italy is one of the founding fathers of the ISRA organization, and was inducted into the Hall of Fame in the first induction ceremony in Sulmona Italy in 2017. Giovanni, or “Joe” as he is known to the English speaking slotracers was a big force in uniting the European slot racers with the British racers, and bringing everyone together and agreeing on classes and racing conditions that ISRA still races under today. In addition to being one of the driving forces behind ISRA, he is also a ISRA World Champion, taking the win in the production race in 1996 along with Italian great, Alberto Capra. Giovanni continues to be involved in slot racing, being involved in the formation of the NSR Slotracing company with his good friend Salvatore Noviello in 2011, and more recently with the launch of his Thunder Slot company, and he continues racing in many of the historic slot racing events. We were honored that Giovanni took the time to attend the induction ceremony in Sulmona, and to catch up with so many old friends. Here are some memories of Joe and his work in the early days of UES . Joe came to work in the UK at British Aerospace, I believe in the late 1970s. His greatest asset was his command of English. I first met him in Turin in 1980 and struck up a friendship with him . Majority of the entry spoke no English so Joe was a go between. He would always go out of his to make me feel at home. Over the early years of the UES he was instrumental in cementing the rules and working to bring compatibility to the racing format. He was a true ambassador and a true gentleman. In the 1980s Charlie Gooding was elected Chairman and I became the UK delegate. The annual Championship entry increased during the decade and also the number of nations competing. In 1989 I worked with Joe on changing UK domestic racing. The Championships were staged a Middlesborough in the North East of England. I asked Joe if we could race two formats of 1/32 Eurosport. If we raced to Spray Glue conditions would the Italians race to the British Goop conditions. A fantastic servant to the growth of Slotracing ! !